ighted, Universal Clip That Fits any Phone, MP3 Player or PDA. This great universal clip is similar to the ClipHanger, but has the added benefit of an integrated LED light. It is a one-size-fits-all carrier for any of your portable devices. The sleak design will fit great on any cell phone, but is also great for ipods, other mp3 players, pdas and more. It's slim design makes it perfect for today's smaller devices, and since it will work with any model, you no longer have to search out the perfect carrier for your specific phone. You can even move it to a new phone if necessary, and all you will need is a new adhesive. Unlike typical product cases that add bulk and wear-out with use, this compact, sturdy tool hangs on lightly but securely. Despite its simplicity, Clipacell is extremely useful and convenient. It keeps your phone tucked aside, but handy for answering incoming calls or checking the time. It's Thanks to a clever design, this clip can be affixed to any small device and since it is so slim, you can comforatably put it in your pocket or hook it to your belt with ease. Use it for your cellular phone, iPod, Mp3 player, radio, remote control and more. It's super strong adhesive won't come off until you need it to and won't damage your phone either. Once Clipacell is attached to your phone it is easy to use. Just hold your phone in your palm and use your thumb to flick it open. Easily attach it to your belt loop, purse strap, backpack, brief case, etc. A simple twisting action is all it takes for quick and easy removal of the adhesive, and thanks to this design, it will never come unattached until you decide to remove it. This is the best way to hang on to any cell phone, pda or ipod. Clipacell, takes away the need for a case as it conveniently clips on to your belt loop and allows one handed access to your phone. Its thin profile minimizes bulk and won't poke you or cause discomfort, even while sitting. It is made from a proprietary polycarbonate resin so it is incredibly durable. This is the very same thermoplastic material that is used for bullet-proof glass, helmets and other products that require a balance of toughness and dimensional stability. The convenience hook keeps your cell on the car dash for hands-free calls. It can also be used on a computer monitor, desk, wall, night stand, or fridge. Because the Clipacell sticks up beyond the top of your phone, it also helps to protect the antenna too. Just press the logo to use the integrated LED light. Now you will have a beam of light when and where you need it. This cell phone holder is designed to solve the most common problems people have with their phones. Most ladies keep their phone in their purse. By the time they are able to find it they miss the call. The Clipacell easily hooks onto the strap of your purse, so it is easily accessed. Other cell phone clips are bulky and stick out too far to be comfortable. Clipacell is very slim and easily hooks on your belt loop, pocket or waistband. It moves with your body so it will not snap off and break. Use the included convenience hook to hang your phone in the car. Clipacell adheres to the back of any cell phone with a double sided 3M adhesive and will not come off until you are ready for it to. If you ever decide to change phones, you don’t have to hunt around for another cell phone case, or clip to fit your specific phone. Just twist off the Clipacell, apply a new adhesive, and stick to your next phone. The adhesive circles used for this clip are a common item made by 3M, that can be bought at many stores locally. This compact device can hang from the simplest yet most convenient places. No more worn velcro or one-size-fits-few cases. Order Yours Today! Virtually unbreakable. Just stick it on, and you are good to go. This innovative cell phone holder fits on any mobile device and is convenient and easy to use. Thanks to high quality construction and super strong adhesive, this clip stays in place until you decide to remove it. The integrated LED light only ads to it's conveninece. 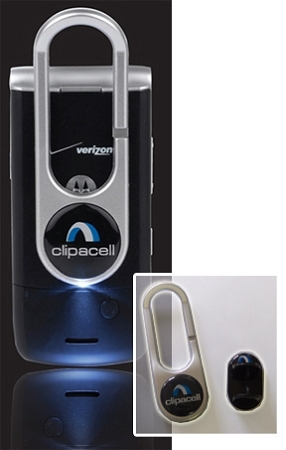 Whats the difference between the Cliphanger Stick and the ClipacellCell Phone Holder, and the does the adhesive come with the cliphangar? They are almost identical, but the clipacell is not longer available. You do get adhesive with the cliphanger.